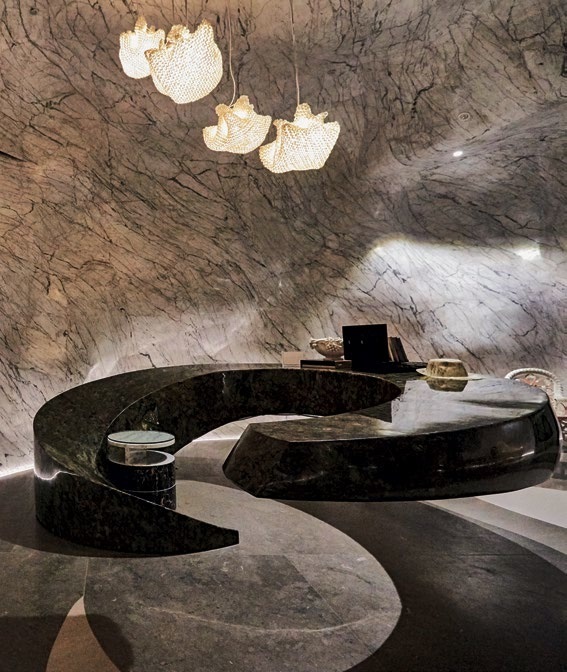 What’s the secret to curved cave walls and intricate floating tables that are unmistakably marble to the touch? 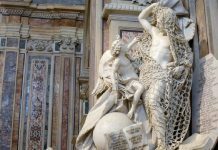 Marble has been used for millennia as a building and art material, and while it has been the medium of monumental works – the Parthenon, the Taj Mahal the sculptures of Michelangelo – the method of shaping it, up to today’s floor tiles and countertops, has largely remained the same. The stone is chiselled or sliced, and one wrong move could spell irreversible damage. 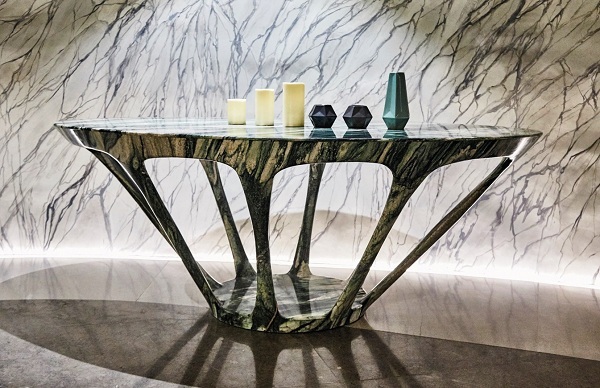 It was certainly a costly lesson for Peter Tjioe, creative director of Indonesia-based marble purveyor MM Galleri, who almost went bankrupt after accidentally shattering a stock of marble table tops. Learning from the disaster, he would add steel plates in between thinner slabs of marble for reinforcement. It was then that he discovered the stone’s limited but existent malleability: With the steel backing, some pressure can be applied to the marble sheet without it breaking. Tjioe then tested the limits of that bendability. The method, which he perfected last year, involves heating a 1mm marble sheet, then slowly moulding it into shape. To prevent it from cracking, a chemical is added to the surface of the stone. The technique can also be used on other hard stones, such as granite and onyx. Says Tjioe: “The result is a sheet we can use like wallpaper to apply on anything, in any configuration.” Such application is unprecedented. 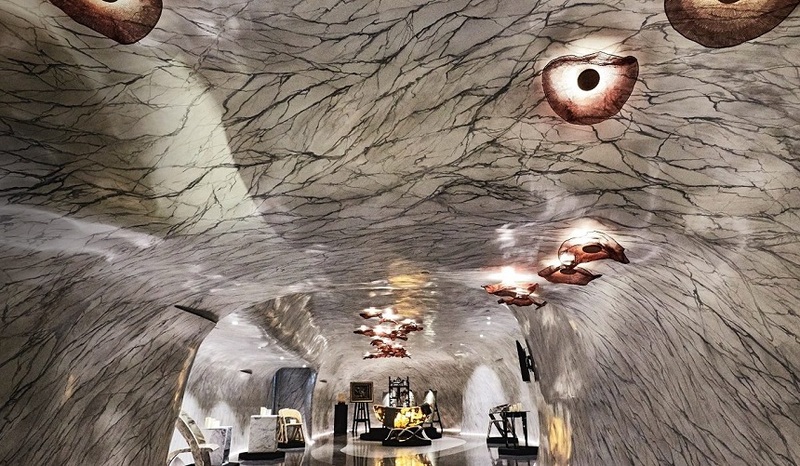 To prove a point, Tjioe created a marble cave in his Chin Bee Avenue showroom by applying sheets of white stone from wall to ceiling (header image). He also created spindly marble chairs and tables – actually steel structures wrapped in thin stone sheets. 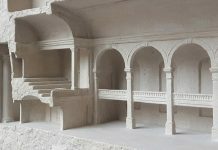 “These pieces are structurally impossible if carved from marble blocks, simply because of the stone’s weight. The thin legs would break,” says Tjioe. The use of steel frames allows designers to bypass structural limitations. The thin legs of this table would break if they were carved from stone. The marble veins are carefully matched by artisans to give the illusion of continuity.